Skull base tumors typically form under the brain or the interface between the brain and the skull. The majority of these tumors are benign; however, their position near the brain and major nerves can cause serious problems. These symptoms can be the result of a tumor as well as a myriad of other conditions, so it is important to consult your doctor if you experience new or worsening symptoms. These benign tumors typically develop behind the tympanic membrane or around the jugular vein. Although slow-growing, glomus tumors can eventually destroy the inner ear and surrounding bones or even enter the brain. Patients with this type of tumor may experience difficulty speaking or swallowing, have gradual hearing loss or a persistent whooshing sound in the ear, or nerve deficits. Radiosurgery is highly effective in stopping the growth of glomus tumors. If the tumor is limited to the space behind the ear drum, it is best removed depending on the age of the patient. Some glomus jugulare tumors may grow into the brain or into the neck. Advanced glomus jugulare tumors cause problems with swallowing, voice, hearing, and facial movement. Meningiomas are tumors of the brain coverings (meninges) which can be benign or malignant. Meningiomas are classified based on how aggressive they are by the World Health Organization (WHO). The majority of meningiomas are benign and classified as WHO class 1. In some older patients meningiomas do not grow. Grade II and Grade III tumors are more aggressive, grow faster and have features of malignancy. Sometimes referred to as neuromas, these tumors originate in nerve coverings. They most often affect the vestibular nerve responsible for balance and the trigeminal nerve that provides sensation to the face. They can involve any cranial nerve though including the voice and swallowing nerves (cranial nerve 9 and 10) and the facial nerve causing facial paralysis. This type of tumor most often affects males between the ages of 20 and 40. Chordomas are typically situated outside the dural covering of the brain and develop from the remnants of embryonic cells. Treatment of chordomas is complicated by the fact that they are located near the brain stem. These are rare, slow-growing tumors involving the bony structures of the skull base. They can affect the temporal bone. 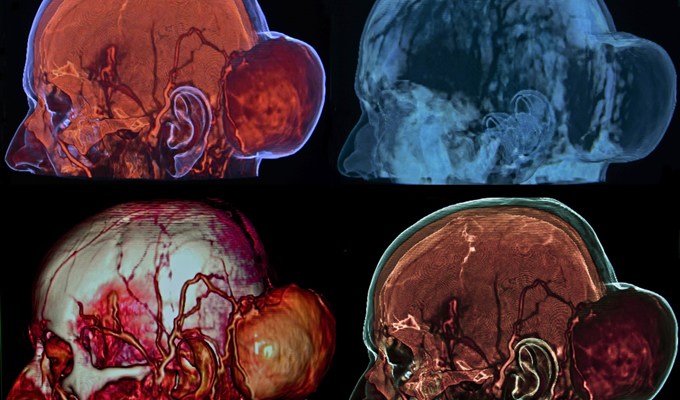 Computer-assisted navigation provides the doctor with a three-dimensional image of the tumor and surrounding brain structures, which greatly reduces the risk of complications. Endoscopic surgery provides a minimally invasive approach to removing tumors and reduces the duration and extent of surgery. Intra-operative MRIs are images obtained during surgery that help ensure that the entire tumor has been removed successfully. Any remaining portions of the tumor can be readily identified and quickly removed. Radiosurgery can be useful for patients with certain types of skull base tumors. A GammaKnife or CyberKnife system directs concentrated radiation at the tumor from multiple directions. Since the radiation is targeted at the tumor, the surrounding tissue receives significantly less radiation.